Part two of the Summerset Abbey Trilogy finds the three women, Prudence, Victoria and Rowena in very different stages of their lives. One is married, one becomes engaged and one is jailed. 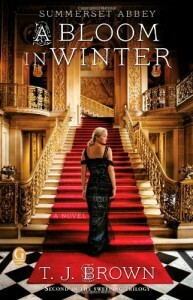 A Bloom in Winter continues the story of the Buxton clan in the early 1900's London, England. Each of the women has a secret. Each suffer loss as they mature and lose their innocence. T.J. Brown has allowed this to become a little romantic without it turning into the "damsel in distress" historical romance. Although love is found in the novel it is also lost. The marriage of convenience turns into a real marriage of love and respect. The one engaged to cover her love of another end up staying engaged. The one jailed learns than she has been much too trusting and innocent at the hands of those she wished to emulate. Many changes took place for all of the Buxton clan as the Lord and Lady Buxton admit to mistakes and strive to make changes in the 'modern' world in which the women live. I enjoyed all the action and changes in the lives of these women, even if I was cheering for other relationships to work. I would like to see more development of cousin Elaine. Perhaps she will learn from her cousins' examples and become a more mature modern woman as well. Perhaps she will even find some romance in her life or maybe just a purpose. The only drawback of this book? It ended much to quickly and I am ready for number three!! !